The Model 383 Piezoelectric Accelerometer is specially designed to accurately measure high amplitude shock and vibration phenomena. The high resonant frequency of 80KHz results in minimum output distortion due to ringing when measuring impact transients with durations as low as 50 microseconds. 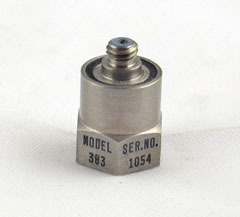 The Model 383 incorporates an advanced seismic system in which the sensing crystal is almost totally constrained and free from zero shift following high energy impacts. This accelerometer is not affected by transverse components of impact and is capable of measurements up to its rated value of 20,000 g's and even to 50,000 g's with stable operation. Its rugged construction ensures long life and high performance stability and repeatability. Internal electrical isolation minimizes ground loop problems from noise currents.